With the multiplication of murderous attacks in Europe and Africa, and with the bloody persecution of many Christians in the Middle East, these recent months show us how profoundly troubled the situation of the world is. In the Church, the recent Synod on the Family and the upcoming start of the Holy Year do not fail to cause legitimate worries. Given this confusion, it seemed helpful to us to inform you of our reflections by responding to your queries. We think that this presentation will make it possible to highlight more clearly how we who are devoted to Tradition should react to the problems facing us today. On September 1st, Pope Francis, on his own initiative, decided to allow all the faithful to make confessions to priests of the Society of St. Pius X during the Holy Year. How do you interpret this gesture? What does it mean for the Society? We were in fact surprised by this action of the Holy Father on the occasion of the Holy Year because we, like everyone else, learned about it through the press. How do we understand this gesture? Allow me to make use of an image. When a fire is raging, everyone understands that those who have the means to do so must endeavor to put it out, especially if there is a shortage of firefighters. So it is that through all fifty years of this terrible crisis that has shaken the Church, particularly the tragic lack of confessors, our priests have devoted themselves to the souls of penitents, invoking the case of emergency foreseen by the Code of Canon Law. On the occasion of the Synod on the Family, you sent a petition to the Holy Father, then a declaration. Why? nullity of marriages, and on the other hand with the final document of this Synod. Hence my declaration intending to recall to mind the constant teaching of the Church on a multitude of points that were discussed and sometimes called into question during the month of October. I will not conceal from you the fact that to me the sorry spectacle that the Synod presented seems particularly shameful and scandalous on more than one count. Well, for example this dichotomy between doctrine and morality, between teaching the truth and tolerating sin and the most immoral situations. We understand that one should be patient and merciful with sinners, but how will they convert if their sinful situation is not denounced, if they no longer hear anyone talking about the state of grace and its opposite: the state of mortal sin, which inflicts death on souls and consigns them to the torments of hell? If someone were to measure the infinite offense caused by the slightest mortal sin against God’s honor and sanctity, he would die of astonishment. The Church must firmly condemn all the sins, vices, and errors that corrupt the truth of the Gospel. She must not compromise with scandalous behaviors or acknowledge a culpable acceptance of them or the public sinners who attack the sanctity of marriage. Why does the Church no longer have the courage to speak this way? Yet there were some positive initiatives on the occasion of this Synod, such as the book by eleven cardinals (following one by five cardinals last year); and also the volume by the African prelates; one by Catholic lawyers; the handbook by three bishops, etc. These fortunate initiatives that appeared recently promoting the defense of marriage and the Christian family give us a glimmer of hope. This represents a salutary reaction, even if certain responses leave something to be desired. Let us hope that this may be the beginning of an awakening throughout the Church that will lead to a rectification and real conversion. Last spring, in a sermon given at the church of Saint-Nicolas-du-Chardonnet in Paris, Bishop de Galarreta said that the Church seemed to be in the process of producing “antibodies” to fight the aberrant proposals being made by progressives on the subject of marriage, who align themselves with current customs instead of seeking to amend them according to Gospel teaching. This reaction on the moral level is beneficial. And since morality is closely connected to doctrine, this could be the start of a return of the Church to her Tradition. We pray for this every day! In the name of mercy, some prelates, like Cardinal Kasper, are trying, if not to change the doctrine of the Church about the indissolubility of marriage, at least to relax the discipline on communion for divorced-and-remarried persons, or to modify its judgment on unnatural unions. What should we think about all these so-called pastoral exceptions? and immediately afterward: “Whosoever shall put away his wife...committeth adultery” (Matt. 19:9). Therefore the Church has only one thing to do: tell the faithful of the divine law and enshrine it in ecclesiastical laws. In no case can the Church diverge in any way from it; that would be to fail in its mission, which is to hand on the revealed deposit of faith. In plain language, in the matter under consideration, the Church can only declare that there was no marriage to begin with, but in no case can it annul or dissolve a marriage that is valid in itself. Is not the September 8 motu proprio that simplifies the procedure for declarations of nullity of marriage a way of recalling the principle of the indissolubility of marriage, while offering easy canonical terms for evading it? In the Holy Year to begin on December 8th, is not a mercy without repentance or conversion being touted? It is true that, in the current climate, an appeal to mercy too easily neglects the indispensable act of conversion, which requires contrition for one’s sins and a horror of sin as an offense against God. Thus I deplored in the last Letter to Friends and Benefactors (#84) the Honduran Cardinal Maradiaga’s complacent support of a new spirituality whose notion of mercy does not require repentance. Nevertheless, if you read carefully the various documents published on the subject of the Holy Year, particularly the Bull of Indiction of the Jubilee, you see that the fundamental idea of conversion and contrition for sins in order to obtain forgiveness is present. Despite the reference to an ambiguous mercy that is said to consist of restoring to a human being his “incomparable dignity” rather than the state of grace, the Pope means to promote the return of those who have left the Church, and he multiplies the concrete initiatives to facilitate recourse to the sacrament of penance. Unfortunately, he does not ask himself why so many people have left the Church and stopped practicing their faith, and whether there might be some connection to a certain Council, its “cult of man”, and its catastrophic reforms: unbridled ecumenism; a desacralized and protestantized liturgy; a relaxation of morals, etc. Quite obviously there arises the question of our participation in this Holy Year. In order to resolve it, a distinction is necessary between: the circumstances that bring about a Holy Year or Jubilee and its very essence. The circumstances are historical, connected with the major anniversaries of the life of Jesus, in particular of his redemptive death. Every fifty years, or even every twenty-five years, the Church institutes a Holy Year. This time around, the point of reference for the opening of the Jubilee Year is not just the Redemption — December 8th is necessarily connected to the redemptive work begun with the Immaculate Mother of God — but also the Second Vatican Council. This is most unsettling, and we reject it forcefully, because we cannot rejoice in, but rather must weep over, the ruins caused by this Council: the precipitous drop in vocations, the dramatic decline of religious practice, and above all the loss of faith described by John Paul II himself as a “silent apostasy”. Nevertheless the essential components of a Holy Year remain: it is a special year in which the Church, upon the decision of the Supreme Pontiff, who holds the power of the keys, opens wide her treasures of graces so as to bring the faithful closer to God, especially by the forgiveness of sins and the remittance of the punishments due to sin. This the Church does in the sacrament of penance and by indulgences. Such graces do not change; they are always the same, and only the Church, the Mystical Body of Christ, has power over them. We might also note that the conditions for obtaining the indulgences of the Holy Year are still the same: confession, communion, prayer for the intentions of the Pope — which are objective and traditional, not personal. Nowhere in the reminder of these habitual conditions is there any question of adhering to the conciliar novelties. When Archbishop Lefebvre, with the whole seminary of Écône, went to Rome during the Holy Year of 1975, it was not to celebrate Council’s tenth anniversary, although Paul VI had mentioned that anniversary in the Bull of Indiction. Rather it was an opportunity to profess our Romanitas, our attachment to the Holy See, to the Pope who, as the successor of Peter, has the power of the keys. Following in the footsteps of our venerable founder, during this Holy Year we will concentrate on the essential components of it: repentance so as to obtain divine mercy through the intermediary of His one Church, despite the circumstances that some have thought necessary to invoke as requirements for celebrating this year, as was the case already in 1975 and again in 2000. In several recent statements you seem to want to anticipate the one hundredth anniversary of Fatima by inviting the faithful to start preparing now. Why? From the perspective mentioned in this letter and in order to insist on the urgency of conversion, we thought of connecting these corporal and spiritual works of mercy that we are invited to perform this year with the centenary of the apparitions in Fatima, in which Our Lady insisted so much on the necessity of conversion, of oneself and of the world, on the necessity for works of penance and on prayer, especially the Rosary. Imploring divine mercy is closely connected with the Fatima apparitions: the Blessed Virgin invited us to pray and do penance, and this is how we will obtain mercy, not otherwise. It seems to me quite beneficial to tie these two future anniversaries together this way by making them two years of efforts to draw closer both to the Most Blessed Virgin Mary and to Our Lord, both to the Immaculate Heart of Mary and to the merciful Sacred Heart. The Society of St. Pius X will organize an international pilgrimage to Fatima on August 19th and 20th, 2017. But already we can and even must prepare ourselves, especially when Catholic morality is seriously being challenged. You understand this very well, dear friends and benefactors of the Society of St. Pius X. Your fervent prayers, your admirable generosity, and your constant devotion are for us an invaluable support. 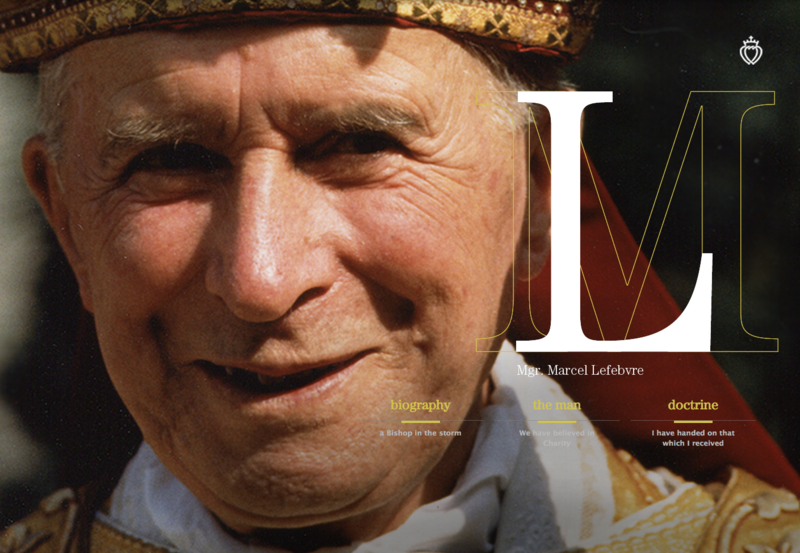 Thanks to you, the work of Archbishop Lefebvre is developing everywhere. With all my heart I thank you for this. We pray to Our Lady to obtain for you all the graces that you need. We ask the Good Lord to grant you His blessings for you and your families, so that you may prepare for the great feast of Christmas by a holy Advent, and that you may entrust the coming year, with its joys and crosses, to our Mother in Heaven.